ICDC was selected to provide construction management services for a local Maryland general contractor. 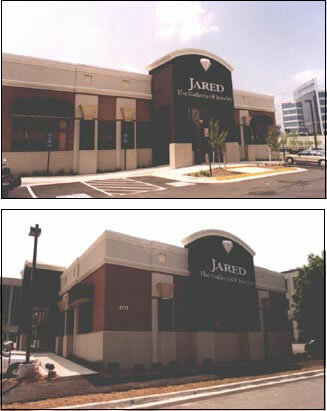 Our experience with Fairfax County, Virginia, as well as with fast-track construction, enabled the project to commence with demolition and abatement of an existing building the first week of September, and complete the entire project in 14 weeks; in time for Jared to open for the holiday season. Coordination of the schedule was critical due to the number of owner furnished materials and the lack of on-site storage space. For each item delivered, we had to make sure that each piece of equipment and fixtures were installed immediately upon receipt. While the fast-track building process posed a challenge, the change from fall to winter conditions at the end of November created another obstacle for the mid-December deadline. Despite the request to provide overtime hours, site conditions made it extremely difficult to complete exterior EIFS, concrete and asphalt paving with below freezing temperatures. Daily coordination with the site superintendent and the subcontractors allowed for a difficult, but timely completion.